Don't Kaieda and DPJ know how to say anything other than 'No'? 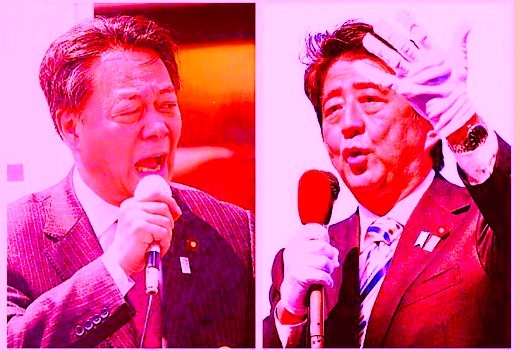 There was a stark contrast between Prime Minster Shinzo Abe and Democratic Party of Japan President Banri Kaieda during their debate in the Diet. Backed by the recent surge of stock prices and a high public approval rate, Abe looked confident--even relaxed--while Kaieda's attacks on him made no impact. As long as the leader of the largest opposition party continues such a lackluster performance, Diet debates will have no vigor. On Wednesday, Abe and opposition party leaders had their first debate under the second Abe Cabinet. Kaieda emphasized the projected side-effects of Abenomics. He said the Abe administration's massive monetary easing would hurt people, especially those living on pensions, by raising the cost of living. He also expressed concern about the government's ongoing discussions on deregulation that could pave the way to increased job cuts at companies. Abe responded by saying that the amount of pension benefits will go up as commodity prices rise, and stressed that inflation will eventually lead to wage increases. "We have created 40,000 jobs in the past three months, something the DPJ-led administrations never achieved," Abe said. Since the launch of the Abe administration, the excessive appreciation of the yen has been rectified, and stock prices have been hovering at high levels. If Kaieda does nothing more than harp on his concerns about Abenomics, we can never expect constructive Diet debates. We expect the DPJ president to express his own views on how to end deflation and spur growth. In other words, Kaieda should present concrete counterproposals. It was Abe who brought up the issue of the bill to rezone electoral districts in the House of Representatives by eliminating five single-seat constituencies without adding any. It seemed the prime minister was trying to take the upper hand in debating the topic. Abe, who is seeking to pass the bill ahead of other electoral reform measures, asked for Kaieda's cooperation. Abe said: "The public has been demanding that we rectify disparities in the value of votes. As members of the legislature, don't we have the responsibility to meet this demand?" Kaieda refused to go along, saying that the main promise [between the DPJ and the LDP] on electoral system reforms was to slash the number of seats. However, we have to say his remarks totally miss the point. In November, a lower house electoral reform bill to eliminate five single-seat constituencies was enacted, and we have to remind Kaieda that the DPJ agreed on passing it. However, now the party opposes the rezoning bill, which would prepare an environment for the realization of the first bill, insisting that more drastic reform is necessary. It is apparent that the ruling parties would never agree to such an unreasonable demand from the DPJ. The DPJ, saying that eliminating five single-seat constituencies is insufficient to rectify vote-value disparities, has submitted a bill to cut lower house seats by 30 in single-seat constituencies and 50 in proportional representation blocs. However, other opposition parties refused to go along with the DPJ's proposal. The ruling parties have submitted the rezoning bill to a related lower house special committee. However, in protest of the move, the DPJ, Nippon Ishin no Kai (Japan Restoration Party), Your Party, the People's Life Party and the Social Democratic Party refused to participate in Diet deliberations on Wednesday. While I am no fan of the prime minister's policies, the points the Yomiuri's editors are making are sound. Kaieda and the DPJ are not playing politics at Abe's and the LDP's level. They are stuck recycling stale rhetoric from a decade ago. Looking at the most recent round of polls, the DPJ is perilously close to falling into secondary status alongside the Your Party of Watanabe Yoshimi. Such actions cannot be expected to work, and only give the impression to the public that the opposition parties are putting party interests before all else and ignoring the issue of rectifying vote-value disparities. Because we all remember how ferociously The Yomiuri Shimbun criticized the LDP for its constant saying of "No" to anything the DPJ-led governments proposed; how the paper was up in arms about unrectified voting disparities giving unnatural permanent majorities to the LDP; and how the editors have never stopped haranguing the members of the LDP for their putting their own and their party's interests above those of the nation. Because The Yomiuri Shimbun is an independent news organization, correct? Oh, to heck with it. The editorial board of the Yomiuri should save time-- theirs and ours -- and just fill the "From the Editor" space every day with a big "I ❤ You LDP, Now and Forever!"